I am really excited to share this week’s Etsy Spotlight because I have been quiet a fan of Gray Works for a little while. There is nothing that gets me more weak in the knees than seeing clean modern designs mixed with rustic simplicity. The best design to me is the simplicity and the closest to the original element. In this case we are talking wood. Gray Works embraces the grain of the wood, the knots, but creates simple lines that can be loved by anyone with any kind of style. What I love more is how they shoot their product. How you shoot your product really helps the buyer engage with the item and they have perfected the art of it. 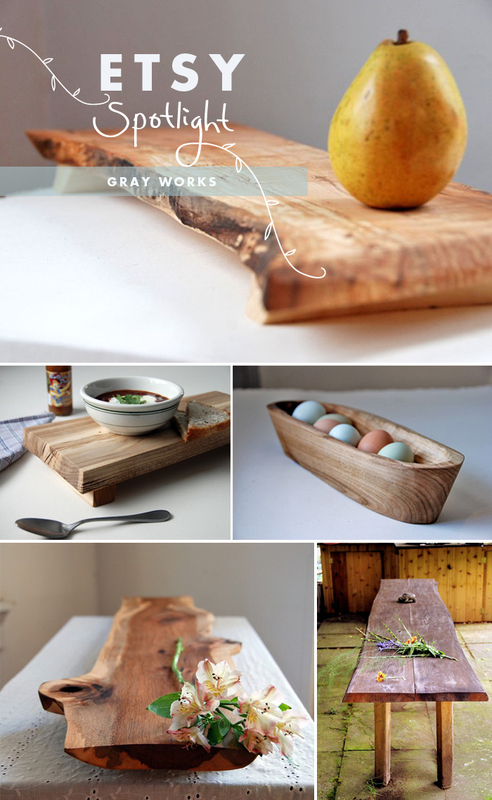 These pieces feel very useful and the boards are can be used for more than just cutting but serving, center pieces, or even to eat some breakfast in bed…why not?! Not to mention their work is at a great price range so if you are looking for a great gift for someone or for yourself this shouldn’t break the monthly spending budget at all. Make sure to check out their Etsy Page and I would love to hear what you love about Gray Works’ work.